The Spice Stellar Mi-425 device can now successfully rooted/unrooted without losing the stock recovery by using the given below guide. Please make a note that the unrooting guide listed here works fine by using “SpiceMi425itsJameROOTING.zip” file. Device rooted by using other methods can also try this unrooting method; but still we do not recommend. DISCLAIMER : Best Android Blog would not be held responsible/liable for any damages that takes place to your device while following these procedure. So, do everything at your own risk. Before start to proceed take full backup of your data with backup applications. Just in case if you lost your data due to any reason you could easily recovery them with the help of backup. Then charge your device battery fully or else your device may get switched off during the middle of the process due to battery low. And also disable or uninstall all the antivirus suites in your mobile as well as computer. Because this may interrupt the rooting process. Enable the USB Debugging in your device by following the path “Settings>Applications>USB Debugging”. Finally, download and install the ADB and other drivers from SPICE CD. 1. First, download and extract the Spice Mi425 Jame Rooting Unrooting Tool. 2. 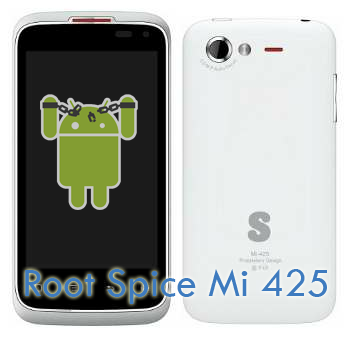 After that copy the “SpiceMi425itsJameROOTING.zip” file or “SpiceMi425itsJameUNROOTING.zip” file to SD card of your Spice Mi 425 (instruction to copy files while in CWM Recovery can be found in README file). 3. After that turn off your mobile (if it is on). 4. Boot your Stellar in fastboot mode by holding Volume Up + Power buttons together till you see a green screen. 5. Now connect your mobile to PC via USB Cable and wait for fastboot drivers to install/load automatically (tested in Windows 7). If it did not load drivers by default then you can install it manually through the available Spice CD provided above. You will see Windows notification icon if it is connected. 6. Run “fastbootDeviceCheck.bat” to check device connection. 7. Run “fastbootTempCWM.bat” to temporarily boot in CWM Recovery. 8. Shortly your mobile will load into CWM Recovery. 9. Select the second option “install zip from sdcard” and press enter button(on screen). 10. After that Select “choose zip from sdcard” and press enter button. 11. Again select “SpiceMi425itsJameROOTING.zip” or “SpiceMi425itsJameUNROOTING.zip” file, depending on your requirement and press enter. 12. Finally, again select “Yes – Install SpiceMi425itsJameROOTING.zip” or “Yes – Install SpiceMi425itsJameUNROOTING”, depending on your requirement and press enter. That’s it You’ve either Rooted/Unrooted your Spice Stellar Mi-425 device successfully. Congrats!